The two suspected killers of the 12 people at the Charlie Hebdo newspaper in Paris are dead. Their hostage is safe. The brothers were killed when they came out of the hiding place shooting at security forces. Looks like they decided to go out in what they perceived to be a "blaze of glory." Here are the suspects believed to have killed the policewoman and taken hostages at the Kosher market. 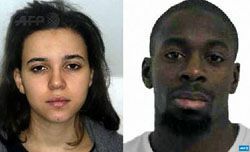 They are Hayat Boumeddiene (L) and Amedy Coulibaly(R.) Coulibaly was killed by police. Boumeddiene got away. (Added: It's unlikely she was ever there.) The FBI and French police are searching for her. Some of his hostages are safe. 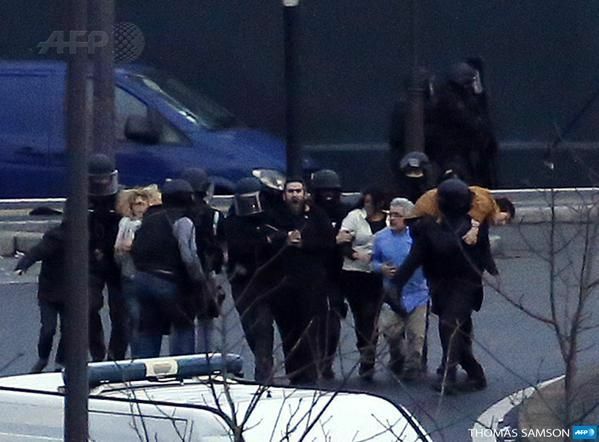 Here's a photo of some hostages being taken from the market. AFP reported 4 besides the gunman were killed in the market incident. They since revised that to four are critically wounded. It's also not clear whether the four are hostages or police or a combination. Who's Behind The Charlie Hebdo Attacks? What a sad day in Paris with 12 dead in a terror attack at the Charlie Hebdo newspaper. The BBC has good ongoing coverage. 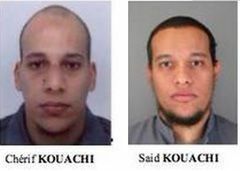 French police published the photos above of two of the three suspects, Said and Cherif Kouachi, 32 and 34, French brothers reportedly of Algerian descent who were born and raised in Paris.